Little north-east wind may bring about a winter in Hanoi begin. Autumn hesitate, affect to say goodbye in the vast Com flavor, fragrance of milk flower passionate, ecstatic street in sunshine yellow like honey. Winter falter with the first winters of the north mix into the rain, rain leaves flying filled the air, followed cold of moments to start new the seasons. 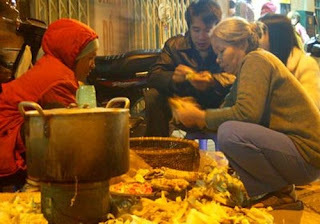 It is the time all the streets of Hanoi appear kiosk toasted corn very aromatic inviting passersby to look for some warmth in the winter. By far, toasted corn – nosh considered a little the soul of countryside where this city – has become was very familiar with all the Hanoi people every winter come. Simple gift, but folk have real traction everyone. Just a glimpse of the shadow of corn with a red flower pots coal fire is the desire to blossom and we can not allow myself to enjoy. It seems that people like to eat corn grilled Hanoi as a habit hard to quit. 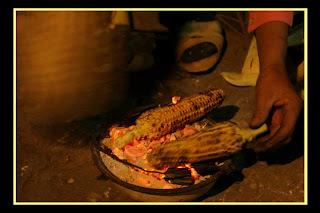 In the cold of winter, people often prefer to sit through the charcoal grill that leisurely eating corn. Open somewhere, under the lamp post, a small alley or sidewalk width, the image woman sit on the charcoal bowl rotating the corn strain spill milk, fan the flame red, surrounded by the guests with his eyes eagerly waiting to enjoy their corn, mixed with bits of gossip is no longer a stranger. Maybe toasted corn was not born for another season, not for time but to correct this season, this moment will be when the chilly, surrounded by north-east wind who may come, when the night turned red basin coals shimmering that see all the poetic delight of food. The days which wind changes its direction that sit in the baked corn basket so great. Sun as cold, eating toasted corn as delicious. Especially at night, when the cold worse eating a toasted corn had just charcoal pots that interesting part and multiply my heart feel warm dust because baking corn, scented. The way people enjoy toasted corn variety very . Visitors who are carefully each small corn be put into the mouth, sip such as fear of a sweet taste that melts away so fast, people are eating out each class to another class of this class regularly and stylish … Perhaps also dependent personality and lifestyle of each person. Toasted corn appears everywhere, inside and outside the city, from the small alley to the big street, from urban centers to remote regions along the external … Corn for grilling is the only white corn was brought from the countryside such as Hoa Binh, Ha Tay, Phu Tho, Hung Yen … However, one type of corn planted in the yard between the Red River -Tu Lien bank – small corn, small round seeds, ivory white that the gourmet choice more. From dawn of Long Bien market was crowded to get the corn, to get up really early would choose the new delicious corn still wet dew. This type of soft corn, aromatic more varieties of corn. According to some people have experience of fan corn who said corn for grilling corn is fresh, break of day, by just over a day to the sweet, glutinous maize will decrease a lot. Winter Hanoi has many gifts, food melt away the numb cold as hot pot, heat snail, banana cake… But one thing which presents home town that a grilled corn always won the hearts of many people by its simple, rustic as the name.In subtle mist, cold – grilled corn becomes a joy to bring the warmth of our people, to the far away image of a street corner, a dim yellow light, and thin smoke fibers flying up to be unforgettable in the minds of people away from Hanoi. Please sit down a minute red glowing coals pot, the smell, the aroma of any desire to wait the turn in the flickering flames in her hand rhythmically of girls sell corn. Faces in the morning – at night, tingling laughter, people come together over the and Hanoi winter seemed to stop. Oh winter, hello Winter. You come here so that we can face the warm woolen scarves, so we can enjoy a hot cup of coffee in the familiar shop so that we can breathe of cold in morning dew and freezing for a chance at mid-winter cold, we were swooping into a grilled corn in roadside that know myself living in a sweet winter Hanoi.